Hey is that Fruit Punch?.................EWWWW ITS BLOOD!!!! The PlayStation 2 got a decent dose of bloody Roman history earlier this year with Shadow of Rome, a more or less playable version of the movie Gladiator. However, Sony has completely upped the ante with God of War, an adventure of Herculean proportions that brilliantly plays off Greek mythology and delivers one of the most intense gaming experiences of the year. The game's premise is as ancient as the mythos itself: Ares, the titular deity with serious self-esteem issues, has gone on a rampage and must be stopped. 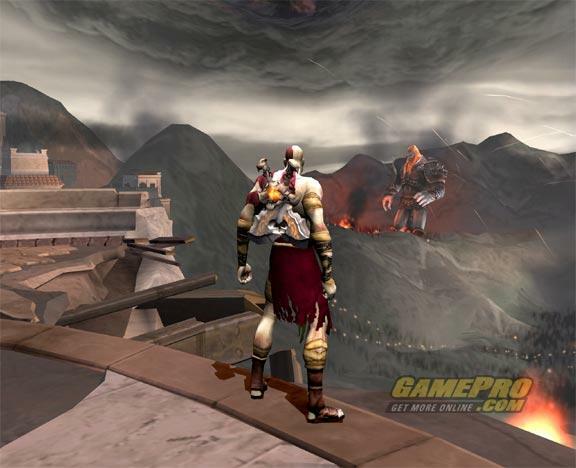 Being Greek gods (who are prone to sit on their eternal asses and "empower" others to do their dirty work), a mortal dutifully takes up the task: Kratos, a tortured Spartan warrior who can pry off Gorgon heads, tear some enemies completely in half, and perform other super-human feats. 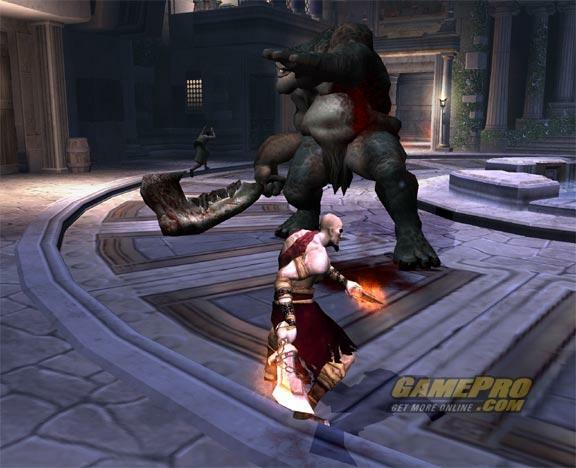 Formidable as Kratos' strength is, the only thing that can kill Ares is Pandora's Box, an artifact resting behind a series of bosses, devilishly constructed traps, and perplexing puzzles (most of which come in the form of moving objects and pulling levers). Borrowing perhaps a bit too liberally from Devil May Cry (the first one, anyway), Kratos is a serious-minded one-man slaughterhouse, sans the oh-so-cool swagger. Equipped with a pair of extending chains each capped with a sword, the Spartan uses these weapons for mid-range combo attacks, including vicious air-juggles. Larger foes, though, require more skill, and some must be softened up before they can be finished off by a series of onscreen button-press cues. Additional combos are unlocked by cashing in dead souls collected from felled enemies. Accessory weapons are also available. For instance, once you wrench off Medusa's head, it can be used as a power-up to temporarily petrify enemies that can then be shattered if struck before they can thaw. The gods chime in, too, and dole out various devastating powers, such as Zeus' lightning bolts and Hades' dead souls. Robust fighting engine aside, God of War draws additional strength from the sheer diversity of tasks to be completed and the clever way it plays off the source material. 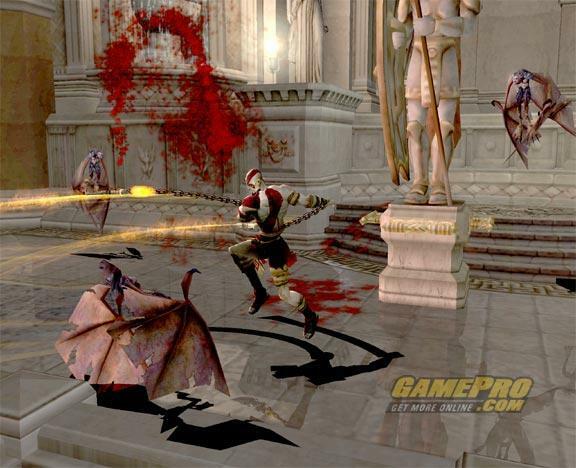 Classic monsters, such as the Hydra, Minotaur, Sirens, and Harpies (among others) require specific techniques in order to defeat as the events take place against a driving music score reminiscent of the best Roman movie sagas like Ben-Hur. The excellent visuals bring these foes to life and the detailed architecture deliver the aesthetic punch of an era long gone. All is not perfect on Olympus, though. The inconsistent camera (that destroyer of other games) takes its toll as it makes seemingly simple tasks like navigating lengthy catwalks more perilous than it should be, and some of the puzzles rely excessively on split-second timing and result in repetitive trial-and-error. Setbacks aside, God of War is an exhausting, epic quest that challenges the mightiest video game warrior from the throne of their living-room couch.